I called my buddy Johnny over and introduced him, “Johnny, this is Edward.” They shook hands and Johnny squatted down beside us. Edward began to open up, sharing his shame over his choices and his disappointment in himself. He and Johnny connected immediately—not only about the hard stuff but they got to laughing just as quickly. We took Edward to lunch that day and a friendship was born. Little did we know that Edward would in a month’s time be hospitalized with digestive issues only to find out that he had colon cancer. With no family there to support him, we had the privilege of stepping in to be Edward’s family. Someone from our small team was with him every day, sometimes for hours … sometimes we were all there, huddled around his hospital bed, joking and laughing and holding hands and praying. A Catholic Church in Allen read Edward's Meet the Need and rallied to send him notes of encouragement and small gifts. Those were sacred days. Edward had surgery and after he recovered was released from the hospital with no safe place to go. He would also have to start chemotherapy soon to treat the cancer. With no other good option, he ended up living at a boarding home in Ft. Worth; Johnny helped move him in. By the grace of God, Edward was soon after approved for a housing voucher and placed in an apartment a mile down the street from Baylor. Our friends Kim and Gayle and an organization called BedStart helped furnish his apartment. He was also close enough to us that we were able to see him multiple times a week. Sure enough, not days after returning from treatment, Edward relapsed, and so began a painful march … one in which halfway through the month all of us on his support team would get a call … “I’m hungry,” he’d tell us. He had spent all of his money on crack. And month after heartbreaking month, I would look him in the eye to say, “I love you and I can’t give you money. It is so hard to see you hungry and not help you.” Sometimes I would cry with him. We were all together learning that keeping boundaries was a painful business. I remember praying month after month, asking God, “When will it change? Will he change?” I started fearing that our friend Edward might die in this cycle of drug abuse. All through these months, we still met him for his treatment at Baylor, would take him to coffee or lunch, and he would volunteer with us when he was clean after he ran out of money the second half of the month. We still loved him and were actively involved in his life, we just couldn’t feed his habit. 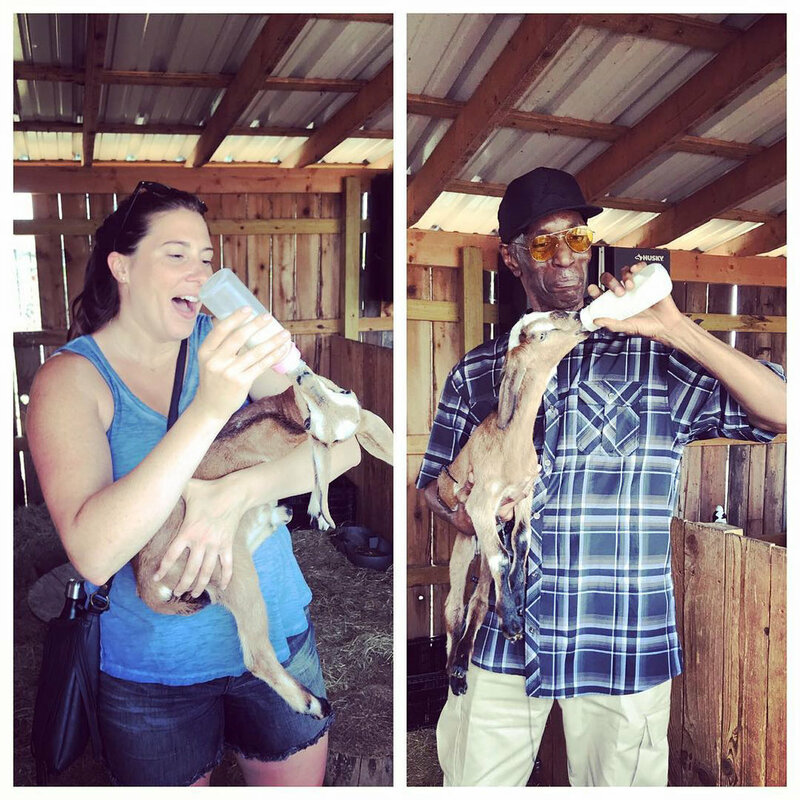 Hayley and Edward feeding baby goats on the Farm! We had to let him go … to love him still but to let him go. We could not change him. And then after nine months of this pattern, something started to shift. He started talking of his desperation, of his willingness to try something new. With that, we placed him for work at Bonton Farms. He started going there a few days a week and not only had purpose in work but got to be loved on by the guys over there. He stayed clean for two months, and then it happened again: He used, he disappeared. When he resurfaced, he was ready. Providentially, Johnny, who had moved to New York City, was in town during these few days. Along with the help of our friend Trog at Bonton Farms, we supported Edward every step of the way as he chose to enter the six-month Salvation Army rehabilitation program for men. It's important to note that Edward went because he wanted to. No one forced his hand. This was a decision that only he could make. Johnny spent the few days before he got in with him, night and day, to encourage him, laugh with him, and make sure he wasn’t alone. Our friend Nick and his wife invited Edward to spend the night at their house the night before he entered The Salvation Army. They spent that evening playing chess, sharing a home-cooked meal, and enjoying quality time together. It has been almost 6 months since Edward entered, and he is now about to graduate from the rehab program! Other than the six years he spent in prison for felony possession, these past six months mark the longest time in his adult life he has ever been drug free. Edward is a 64-year-old man, and these past six months are the longest he’s been sober in his adult life. We call this a miracle, and to us his story ministers that it is never too late. HOW YOU CAN HELP: When Edward leaves the Salvation Army in early March, we will need a support team to circle around him. Will you consider joining his team? Email us advocacy@thehumanimpact.org if you are interested in learning more.